Nestlé has today (21 November 2016) announced a four-year deal with Barcelona Football Club to promote Milo processed food (which is nearly 50% sugar). Oh, sorry, Nestlé says it is a deal to “promote healthier lives“. Someone sent me a link to the clip below on junk food industry marketing to children, produced by the Rudd Centre for Food Policy and Obesity (watch it below). We have monitored how Nestlé targets children for a long time. This includes under the guise of encouraging exercise. This is a favourite Nestlé strategy as it shifts the healthy lifestyle focus away from food onto exercise, gives it things to boast about in its corporate social responsibility public relations campaigns and, of course, provides a route to target school children with unhealthy products. In the UK, Nestlé co-opted schools to promote its high salt, high sugar breakfast cereals to pupils through its ‘box-tops for education‘ scheme. This backfired in many schools when pupils and parents objected because of the health concerns – and because of Nestlé’s baby milk marketing practices. Some schools event wrote to all parents saying they would not support the scheme, explaining why. Nestlé cancelled the scheme in March 2015. In many countries Nestlé sponsorship is linked to processed drinks, such as Milo, its high sugar chocolate malt drink (nearly 50% sugar). For example, in Kenya it sponsors the primary-school soccer league. Below, the under-13 team off to Nigeria in 2014 for the Milo® Africa Championships. Brandchannel.com suggests the Kenya sponsorship is also an attempt to improve its image in Africa, tarnished due to its marketing of breastmilk substitutes. (An earlier attempt to donate money to Nelson Mandela’s Children’s Fund in return for a photo-opportunity of an executive presenting the cheque was refused – see: Nestlé desperate to link with Mandela says Lord Attenborough). Nestlé also entered into a five-year sponsorship deal of the International Association of Athletics Federations (IAAF) Kids Athletics programmes in 2012. This is part of the strategy of Nestlé Chairman, Peter Brabeck-Letmathé, to rebrand the world’s largest processed food company as a Nutrition, Health and Wellness Company. In the US, Nestlé sponsors youth soccer with Nesquik – another product that you don’t find on your five-a-day list. This new clip from the Rudd Centre for Food Policy and Obesity explains more about how the junk food industry targets kids (it has a US focus). 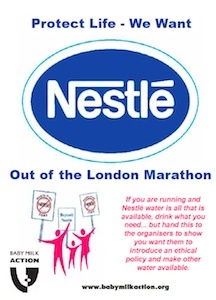 Nestlé is also criticised over its appropriation of community water supplies and attempts to improve its image by sponsoring events such as the London Marathon and Los Angeles Marathon. Nestlé has been particularly criticised for extracting water in California for the Arrowhead brand – promoted at the LA Marathon – at a time of drought and without a current licence. Nestlé sponsoring exercise is no less ironic than it attempting to hijack breastfeeding initiatives to divert attention from its ongoing, systematic violations of baby milk marketing requirements. Peter Brabeck refuses to stop promoting formula with the claim it “protects” babies, despite knowing that babies fed on formula are more likely to become sick than breastfed babies and, in conditions of poverty, more likely to die (see examples on the Nestlé labels sheet in the Nestlé-Free Zone). While Nestlé has billions to spend on these strategies, we rely on your support to monitor what it is doing, raise awareness, work for legislation and run campaigns that stop some of its unethical practices. Donate – you give us power. Also see: Seeing through the Spin schools pack, with exercises for students on understanding corporate communications. Briefing paper: Tackling Obesity: How Companies use Education to Build Trust.